A solid-sounding, high quality sub, that's a worthwhile addition to any studio's monitoring set-up. Well-designed, crisp sound and noise-free construction. No power indicator on the front. 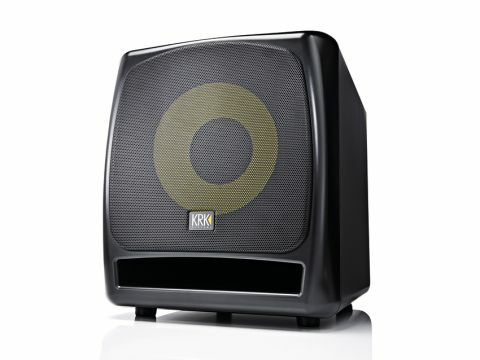 KRK's 12s slots into the middle of its subwoofer range, between the cheaper 10s and the 12sHO (high output) model. Subwoofers are generally a huge help in most studios and for all styles of music, making the mixing and blending of low frequencies much easier. They can be a great addition to any well treated or acoustically balanced control room and essentially act as magnifying glass for the often forgotten extreme low frequencies. There's certainly no mistaking that the 12s is part of the KRK family with its grey cabinet and yellow 12-inch Kevlar driver, covered with a removable mesh grille. It feels built to last and looks the part too. One word of advice: make sure you have someone else to help you lift it, because it's scarily heavy at more than 30kg (66lb). Getting it into the studio single-handed proves a struggle, and the lack of any sort of built-in carry handles is a real oversight. We also wish there was a power indicator/switch on the front instead of the rear - it's handy to know at a glance if something is powered on or not. Connecting up the 12s between mixing desk and Focal Twin 6 BEs was simple and aided greatly by the well-written manual, which describes positioning and set-up in an easy to understand way. There's a good compliment of connectivity including balanced inputs and outputs (with combo connectors that can accept jacks or XLRs), a footswitch jack for muting the sub in and out (a great feature), an LFE input for integrating the 12s with surround systems, plus unbalanced RCA inputs and outputs too. Control-wise, there are dials to adjust the volume of the sub so it can be matched to the volume of your main monitors and a low pass frequency control that runs from 55Hz to 170Hz. This sets the frequency range that the sub operates at, so that only the 12s deals with the low frequency range and not your monitors. Our ideal placement for the 12s was under the mixing desk, between the monitors, with the phase/polarity switch set to 0. This switch may need to be set to 180 degrees instead, depending on how even the bass response of your room is. You can also switch in the built-in limiter if you like to run your levels hot. In use the 12s is excellent. Running mixes and a Moog Voyager through the 12s proved that its response is smooth across the frequency range, with a solid and deep bass extension that is never flappy or hard to distinguish. There's also little port noise, often a downside of ported designs, and not an ounce of cabinet rattle - the only things rattling were our studio's foundations. We found the 12s a surprisingly useful extension and the low end of mixes was certainly easier to examine and correct. Also, being able to mute in and out the 12s with my Boss FS-6 foot switch was a real bonus for workflow. All in all then, there is little to complain about and we heartily recommend the 12s to anyone in the market for a high quality, very well engineered sub, at a fair price point.